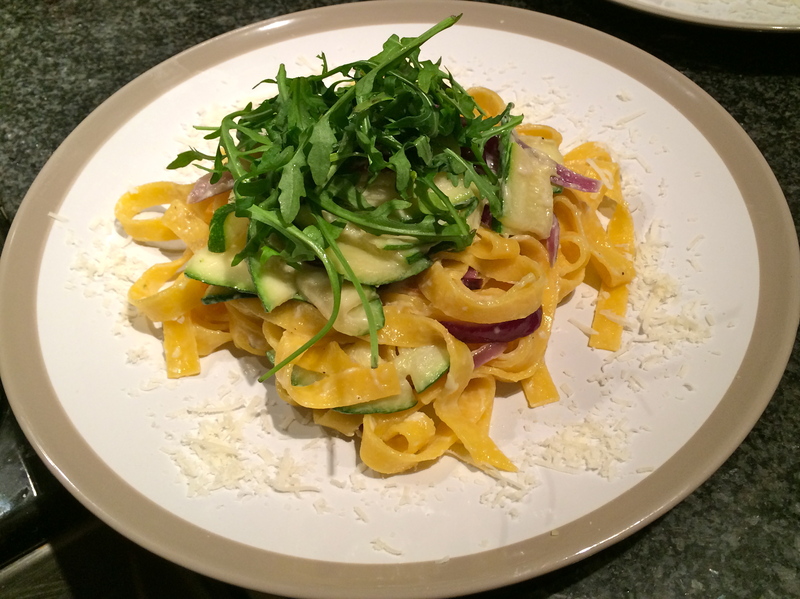 This simple rich and creamy pasta dish is super speedy to prepare, taking less than half an hour, and includes healthy green vegetables in the shapes of courgette and rocket. On browsing the aisles at my local Lidl at the weekend, a pack of fresh egg tagliatelle shone out at me at a bargainous price of less than a pound and I couldn’t resist. And I had some double cream and parmesan left in the fridge from a dinner party at the weekend so decided to whip up this really simple and quick mid-week meal. Understandably, after the indulgent Christmas break, lots of people are trying to be healthy in January, so for a lighter version, you could always substitute the cream for low fat creme fraiche. But you need the cheese. Don’t sacrifice the cheese. 1. Heat the oil in a large frying pan on a medium heat and add the onion. Fry for five minutes until the slices begin to soften and then add the crushed garlic. Stir well for a couple of minutes, being careful that the garlic doesn’t brown. 2. Meanwhile, half-fill a medium sized saucepan with water and bring to the boil. 3. Add the courgette to the frying pan and fry for five minutes, stirring in well with the onion and garlic so it soaks up the flavours. 3. When the water is boiling, lower the tagliatelle into the saucepan and turn the heat down to simmer for three minutes. 4. Turn the heat down on the frying pan and add the double cream. Stir in well so it coats the courgette slices. Add half the cheese, a generous helping of black pepper and some salt. 5. Give the pasta a quick taste – it should have a little bit of bite – and drain, holding back a tablespoon or so of the water from the pan. 6. Tip the pasta and remaining water into the frying pan and stir thoroughly, seasoning further if you think it needs it. 7. Serve the tagliatelle in the middle of large plates with a handful of rocket on top, and decorate the outside of the plate with the remaining cheese.